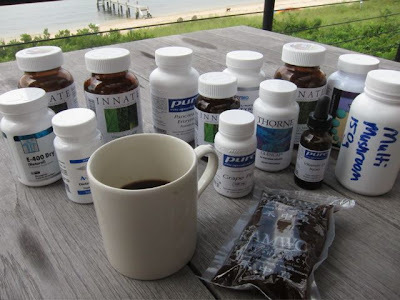 Yesterday I picked up a bunch of supplements and an herbal formula that Paul prescribed. It's a ton of pills to take, most of them I have to take a few times a day. One of them (Butyrate) smells exactly like Parmesan cheese. Another one (Pancreatic Enzymes) is already helping me digest. The herbs taste gross but healthy, this one I sip throughout the day. I have used thyroid supplements natural for more than a year and I have had nothing but great results. I have hypo thyroid and this makes me feel so alert and has helped me lose weight. I also exercise but this and the pill have helped me drop weight. I tried different supplements but ended up going back to this due to my positive results. I highly recommend this product!